Running a day late after Cape Canaveral was inundated with rain showers early Saturday, the experiment-laden Dragon spaceship lifted off at 1:52 a.m. EDT (0552 GMT) after late night clouds dissipated, clearing a route for the 208-foot-tall Falcon 9 launcher to fly into orbit. A nine-engine first stage powered the Falcon 9 into a starry sky, generating 1.3 million pounds of ground-shaking thrust and an orange plume of rocket exhaust as the booster disappeared from view of spectators. After finishing a nearly three-minute burn, the first stage fell away to begin a series of maneuvers to fly back to Earth, heading for a controlled splashdown in the Atlantic Ocean in a technical experiment to help SpaceX make its rockets reusable. SpaceX has tried first stage flyback maneuvers on three previous launches, but Saturday's flight took off without landing legs, and officials predicted a low probability of the stage completing a successful water landing. The Falcon 9's second stage took control to complete the primary task of Saturday's launch -- the deployment of the unmanned Dragon capsule on course to reach the space station Tuesday. The Dragon spaceship separated from the launcher's second stage 10 minutes and 15 seconds after liftoff and extended its electricity-generating solar arrays a few minutes later. SpaceX officials said the Dragon capsule was in good shape after the launch and ready to begin a series of thruster burns over the next two days to reach the space station with more than 5,100 pounds of supplies, experiments and provisions. "Nothing like a good launch," said Hans Koenigsmann, SpaceX's vice president of mission assurance and launch chief engineer. "It's just fantastic. We worked very hard yesterday and weather wasn't quite playing along and today everything was beautiful. "From what I can tell, at first glance, everything was really perfect," Koenigsmann said. European Space Agency astronaut Alexander Gerst will take control of the space station's Canadian-built robotic arm to grapple the free-flying cargo carrier after it finishes a laser-guided final approach to the complex at around 1104 GMT (7:04 a.m. EDT) Tuesday. The robot arm will maneuver the Dragon capsule to a berthing port on the space station's Harmony module, where the outpost's three residents will enter the supply ship's pressurized cabin to unload what's inside. The cargo includes a transporter with 20 mice to probe how microgravity causes muscle atrophy, a 3D printer to demonstrate in-space component manufacturing, and a $26 million NASA instrument to measure winds over the world's oceans. Astronauts will transfer the mice into two habitats aboard the space station, with 10 mice in each enclosure. Half the mice are sponsored by NASA to test out the effectiveness of animal handling procedures in orbit. A pharmaceutical company will study tissue samples from the other mice to help develop muscle atrophy treatments, according to NASA. Ten of the mice will return in mid-October aboard the Dragon spacecraft, and the others are due to come back to Earth in December. Fruit flies were also launched inside the Dragon capsule to study behavioral changes during spaceflight. A commercially-developed 3D printer, built by Silicon Valley startup Made in Space, is stowed aboard the Dragon spacecraft. It will be set up inside the space station to see if 3D printing is viable in microgravity. Funded in a public-private partnership by Made in Space and NASA, the 3D printer is the first device of its kind to ever launch into space. Engineers on the ground will uplink commands to the printer, giving it a 3D model of an object to build out of a stock of plastic carried inside. If it works, 3D printing could help enable future space missions to distant destinations like Mars. "It's especially important when we consider human space exploration," said Niki Werkheiser, NASA's manager for the 3D printer project. "From day one, the supply chain has been very constrained. We have to launch every single thing we ever need from Earth, so being able to make what you need on orbit, when you need it, is a real game changer." NASA's wind-watching ISS-RapidScat instrument is bolted inside the Dragon capsule's external trunk section. Scientists say the sensor will help predict the strengthening of hurricanes in the tropics by tracking winds. Once Dragon arrives at the space station, the lab's Dextre robotic handyman will pull the RapidScat instrument from the capsule's mounting pallet and place it outside the European Space Agency's Columbus module. Other gear to be delivered by SpaceX includes an experiment that could help improve the design of golf clubs, IMAX cameras, and two batteries to be installed into U.S. spacesuits ahead of a pair of spacewalks planned in October. Sunday's launch kicked off SpaceX's fourth operational resupply run to the space station. NASA contracted with two companies, SpaceX and Orbital Sciences Corp., to send up supplies aboard privately-own space freighters after the retirement of the space shuttle. SpaceX's $1.6 billion deal covers 12 cargo missions through the end of 2016. 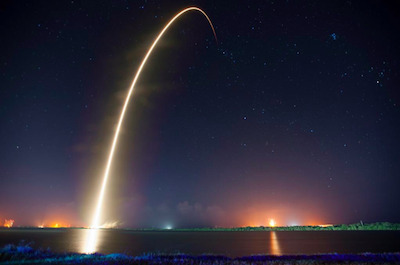 With Sunday's liftoff, SpaceX has launched four of the dozen flights. Before Sunday's launch, Koenigsmann said the cargo flight -- known as CRS 4 -- is establishing a more regular "cargo taxi" service to the space station. "The CRS 4 mission has become somewhat of a routine -- I would say a cautious routine -- because we have to be super careful that everything is reliable and working well and checked out and triple-checked again," Koenigsmann said before Sunday's launch. NASA announced Tuesday it selected Boeing Co. and SpaceX to ferry astronauts between Earth and the space station in the next phase of the agency's commercial spaceflight initiative, aiming for crew flights to begin by the end of 2017. The commercial cargo craft flown by SpaceX and Orbital Sciences are crucial for the delivery of science experiments to the space station. Sunday's liftoff is the fourth commercial resupply flight by the two companies this year, with two more missions on tap before the end of 2014 -- an Orbital flight in October and another SpaceX launch in December. This is the first year SpaceX's Dragon and Orbital's Cygnus spaceships have both been entrusted by NASA to ferry up critical supplies to the complex. "We've worked out a lot of bugs in the system, both on our side and on the vehicle processing, and both companies are learning along the way," said Dan Hartman, NASA's deputy space station program manager. "We're trying to keep our payload throughput up so we can support this increased cadence, but I think we're well on our way. We're looking forward to it quite honestly because stable access and stable return of our research is key." SpaceX's Dragon capsule is the only craft capable of returning large amounts of research specimens and hardware to Earth. Russia's Soyuz crew transporter can bring back limited cargo with its three human passengers, and other logistics spacecraft are designed to burn up and dispose of trash during re-entry. The craft will depart the space station in mid-October, fire its thrusters to descend back into the atmosphere, and parachute into the Pacific Ocean with nearly 4,000 pounds of cargo for retrieval by SpaceX's recovery team.